Just in case you haven’t noticed, Haslet is growing in all sectors. A new Sonic Restaurant just opened in Le Tara Village and the construction of a 10k-sf medical/professional office is underway near the same intersection. On Schoolhouse Road, a 4k-sf professional office building is also under construction. Residential permits are on the rise as well. "Our job growth certainly has impacted the need for more retail and professional services,” said David Miracle, Executive Director for Haslet Economic Development. “We are fortunate not only to have the day-time traffic to support growth but also plenty of land for development. "Haslet Economic Development provided incentives for infrastructure improvements to Le Tara which will also support additional business development along Avondale-Haslet/Hwy 156. Incentive check being presented to Sonic’s Real Estate Director Johnny Jones. 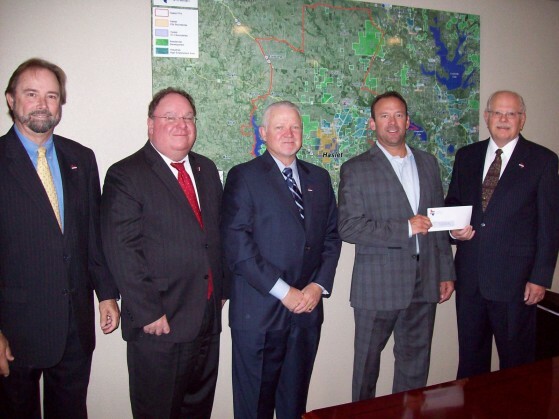 (4th from the Right) Left to Right: David Miracle, Executive Director, Haslet Economic Development; James Quin, City Administrator, City of Haslet; Steve Smith, President, Haslet Community & Economic Development Corporation; Jones; and Warren Robb, Mayr Pro Tem, City of Haslet.